Great support for one of their local teams from MFR in The Highlands. The radio station has got fully behind the promotion of the Cup Final Single, "We're On Our Way" which was recorded only two weeks ago at The Ironworks in Inverness. 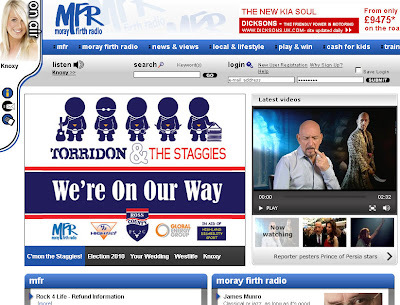 Not only are they providing great airplay for the track but they've add the Edge designed logo and banner onto the from page of their website with a link through to how supporters can help getting the song into the charts. The Edge have provided marketing support not only for the logo design but also in pulling together elements of the original recordning and working with The Music Kitchen in edinburgh to ensure the track was available the week of the final, Ian McCaig was delighted with the results so far. "Dingwall has only a population of I think about 5000 and for the track to chart even in the Scottish Top Forty would be great fun!" The Edge have previously had "chart success" before with a UK Top Ten with Runrig and The Tartan Army and a Top Forty with Pudsey, Tartan Army and "We Have A Dream". The support from MFR is helping the track go viral and it's looking that even with it only being available on iTunes that it could well chart high in The Scottish Top Forty this weekend.